Unique genetic re-wiring of a sodium channel explains how a family of electric fish can generate the highest frequency of electrical discharge seen in any animal. In a study publishing 27 March in the open access journal PLOS Biology researchers Ammon Thompson, Daniel Infield and colleagues at the University of Texas, Austin, University of Iowa, and Indiana University Bloomington show that this evolutionarily modified sodium channel could contribute to the electric organ's high-frequency firing. Electric fish sense their environment and communicate with each other by producing electrical signals from their electric organs. 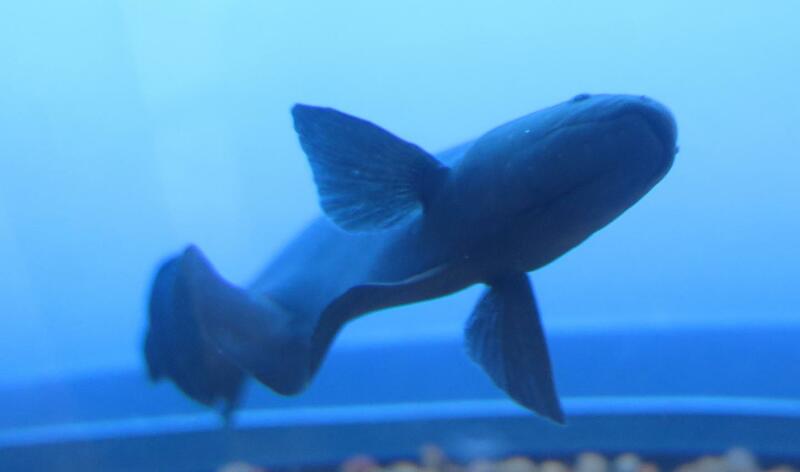 One group of electric fish from the Americas called the Apteronotids, or "ghost knifefish," generate electrical signals through the action potentials of specialized cells that originated from modified motor neurons in the spinal cord. The electric organs of these fish attain the highest frequency action potentials of any cell type in any animal, often exceeding 1 kHz (i.e. 1,000 pulses per second), and can do this spontaneously without input from the brain. Sodium channels are tiny pores that allow positively charged sodium ions in and out of cells in a tightly regulated manner, allowing the generation of electrical signals to regulate cellular functions such as muscle contraction. One type of sodium channel, called "voltage-gated," open and close in response to the voltage across the cell membrane. While comparing genes that encode voltage-gated sodium channels across several electric and non-electric fish species the researchers showed that in the ancestor of a group of fish within the Apteronotids, the gene that normally encodes sodium channels in muscle was duplicated. During the fish's subsequent evolution, one copy of the gene then gained the ability to make sodium channels in the spinal cord where the motor neurons that dictate the firing frequency of the electric organ are located. As well as expanding where the sodium channel was made, subsequent mutations in this new gene caused the channel to open more frequently than its muscle-specific ancestor, likely contributing to the Apteronotid electric organ's high-frequency firing. This is an important finding because this type of channel is present only in the muscles of most animals, including humans; its presence in the spinal neurons of Apteronotids is unique. Sodium channels are an important target of numerous neurotoxins and are implicated in congenital neurological and muscle disorders such as epilepsy and muscle weakness. Future investigations on the mutations displayed by this new sodium channel could shed light on the mutations underlying these disorders in humans. Funding: NSF (grant number DEB-1311521). The funder had no role in study design, data collection and analysis, decision to publish, or preparation of the manuscript. NSF (grant number IOS-1557857). The funder had no role in study design, data collection and analysis, decision to publish, or preparation of the manuscript. NSF (grant number IOS-0950721). The funder had no role in study design, data collection and analysis, decision to publish, or preparation of the manuscript. NIH (grant number HL007121). The funder had no role in study design, data collection and analysis, decision to publish, or preparation of the manuscript. NIH (grant number GM106569). The funder had no role in study design, data collection and analysis, decision to publish, or preparation of the manuscript. NIH (grant number GM087519). The funder had no role in study design, data collection and analysis, decision to publish, or preparation of the manuscript. NIH (grant number EIA22180002). The funder had no role in study design, data collection and analysis, decision to publish, or preparation of the manuscript. NIH (grant number T32049336). The funder had no role in study design, data collection and analysis, decision to publish, or preparation of the manuscript.